I’ll never forget my first trip to New Orleans. I was working in my dream job, working behind the scenes on music specials – this time for the Super Bowl and for MTV’s Mardi Gras in February of 2002. The Tragedy of 9-1-1 and the Twin Towers was still raw and horrific on everyone’s mind. Things plugged along, but major events were cancelled and/or rescheduled…people changed their lives completely… our country was mourning. That year the Super Bowl (with the Secret Service as our security team) took place in New Orleans on the Sunday just before Fat Tuesday. Fat Tuesday is the last day of Carnival and it ends at midnight that night (Mardi Gras). At least I think that’s how it goes. It doesn’t really matter. Mardi Gras is basically the biggest excuse for a crazed-mofo-drunk-party-fest that I’ve ever seen in my life. Speaking of… did you know that it’s a spiritual event? Mardi Gras, that is. Yes… Yep… yep, it is. Okay… it’s a rash of debauchery leading UP to a spiritual event – one LENT. Lent is a Catholic thing. It’s the season of penance beginning on Ash Wednesday, when all good Catholic people refrain from eating or drinking anything yummy, and from doing anything fun for a lonnnnnnng time. And prior to the start of this most pious of times is Carnival (a celebration) which starts on January 6, the Twelfth Night (feast of the Epiphany), and picks up speed until midnight on Mardi Gras, the day before Ash Wednesday (at least in New Orleans). It’s true. I got all the info from this nifty little New Orleans Mardi Gras website. I don’t recall learning this in Catholic school, and I’m a sort of angry about it. I would have enjoyed dressing up every day, partying it up until midnight the night before Lent (even if I only was six years old… I could’ve had milk and cookies before bed – like nightly). I was especially upset after having suffered through a good many Lents myself. Every year I dreaded what was coming: the boredom and nodding off during the Stations of the Cross (our school went to this every week), while a Priest who seemed to hate his job fumbled to read the material aloud as slowly as humanly possible. Oh the horror. If I’d known about partying until Ash Wednesday, our entire universe might be different now. You and I could be living in completely different places and know all kinds of famous people… hell…maybe BE famous! And who knows? My lack of celebrating Carnival prior to Lent may be the very reason we do not know world peace today! I am so…so… so sorry. In case you plan to go to New Orleans this year (f you do, bring me back an elaborate Mardi Gras mask would you? ), I’ve found a schedule of parades and other events here for you. While you’re at it have a King Cake and some Shrimp Étouffée (I can’t handle the crawfish kind) for me. Oh – and laissez les bons temps rouler! (That’s “let the good times roll” for you New Orleans newbies or non-Frenchies). This post was proudly brought to you by Mr. Costumes. 6 Responses to "Is Mardi Gras a spiritual event?" I’m here to help Maria! Great read! 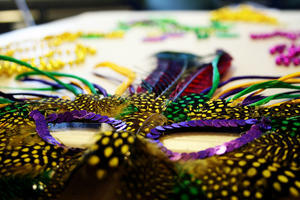 I’ve always wanted to go to Mardi Gras – perhaps one day I will cross it of my bucket list. New Orleans has always fascinated me with it’s crazy mixture of deep religious beliefs from many cultures, its roots on VooDoo and black magic, and its celebration of life and music like no other place (in my opinion). Thanks for sharing! I had no idea Mardis Gras was a religious event – very interesting. Though pigging out the day before Lent doesn’t necessarily sounds Christian to me. Anyhow, interesting!